These are often considered to be one of the most aggressive species of spiders. They are found only in Australia and both the male and female variants of these spiders carry the deadly toxins by the name atraxotoxin. This could kill human beings. They enter homes during hot, humid nights looking for mate and therefore one should be careful. This type of spider is known to cause painful bites and it could be fatal especially for children and also the elderly. There is anti-venom available and the patients should be given it the moment they are bit by these spiders. This species of spider varies around 12 to 20 mm in size. The bite of this spider could cause severe nausea and pain accompanied with burning sensation. In some rare cases, ulceration similar to gangrene could be found. Though the wolf spider is known to possess a poisonous bite, it may not be lethal. It is a non-aggressive species of spider but can be provoked easily. It is sized around 15 to 20 mm in length and has a grey to brow color tinge. This species of spider can inflict an extremely painful bite but the bite is not lethal or poisonous. Some people experience heavy sweating, vomiting, muscular pains, giddiness and headaches. The adult of this species are around 15 mm in size and they prefer dry habitats. They could be considered as low risk and non aggressive category of spiders. It is timid and bites very rarely and that too only when cornered or provoked. It could grow up to 35 mm in body size. It is a ground dwelling spider and prefers dry locations. This is another common type of spider which grows to a maximum size of around 30 mm, while averaging between 20 to 30 mm. They are non aggressive in nature and their bite is consider non-toxic and non-lethal. However, if you get into their habitat, you could find them all over your body and this could create a panicky situation. This is another low risk non-toxic spider but the bite can at times be painful. They grow to a maximum size of 5 to 15 mm and they have a unique yellow and brown abdomen strip. 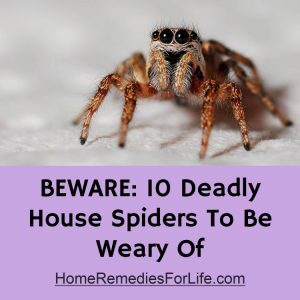 They often could be found in the garden or backyard of your home. This is considered to be one of the most venomous and dangers spiders in the world. Its bite could lead to destruction of the blood vessels and could lead to large skin ulcers. They grow to a maximum size of 7 mm and they could be found in unoccupied buildings and storages areas besides attics. Often referred to as Banana spiders, they are quite aggressive. Their bite can be quite poisonous to humans and they could be perhaps the deadliest of all forms of spiders. The bite could lead to irregular heartbeats, salivation, and painful erections in men. In fact their venom is being tested by scientists as a cure for erectile dysfunction.